Early Friday morning (September 4th) I attempted to reach the manager at Mt. 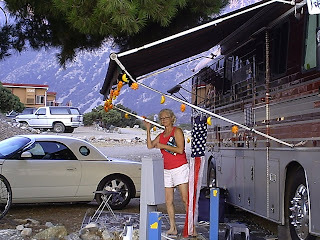 Baldy RV Ranch to find out what the air quality was like, but was not getting through to anyone. There are several major fires in various stages of containment in Southern California even as I write today. The largest of these, the Station fire, is to the east of Mt. 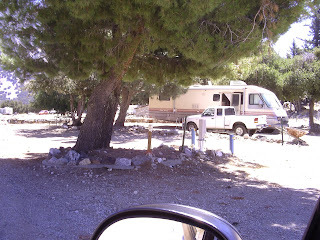 Baldy RV Ranch. 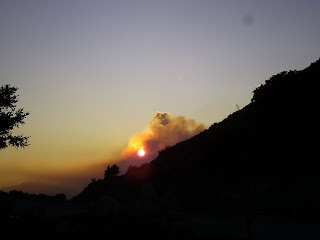 From our home, about 21 miles away, the smoke looked heavy and forbidding, so I wanted to know if we were wasting our time driving our coach up the very steep road (about 8 miles of 6-8% grades). I decided to drive my Ford Expedition up there around 9am to see for myself. I arrived at the "Ranch" around 9:50am, and found the air quality to be fine, with the views to the east and west a little smokey. After determining that the air quality was OK I called Elaine and told her I was on my way home to pick up the Newell and head back up the mountain. She was going to follow me later that afternoon after she finished her various business phone conferences that take several hours every Friday morning, and often spill into the afternoon. I headed out around 12:30pm (in the heat of the day!) and began my crawl up Mt. Baldy Road. There were Forest Service vehicles lining the road, but I was being allowed through. As the grade increased engine and transmission temps increased, not unexpectdly, but I was able to keep them from becoming critical by just reducing my speed and keeping RPM's around 1900. It took me about an hour to get to the "Ranch" and back into my spot (#14) located between 2 trees. The temperature at home was around 98 when I left, and was around 82 at the "Ranch". OUR VIEW THE FIRST NIGHT OF THE "STATION FIRE"
Our first night we were treated to a specatular sunset through the "Station" fire smoke and a lone cloud. Around 7:30pm we drove up to Buckhorn Lodge which has a nice little 4 piece band that plays on Friday and Saturday evenings. We had a couple of drinks and some taco chips, and enjoyed the music. This lodge is celebrating its 100 year anniversary of continuous operation this summer. We spent from Friday (September 4th) to Monday (September 7th) and had a very relaxing, uneventful time.